AUSTIN, Texas -- The Albright football team climbed to No. 16 in the latest American Football Coaches Association Top 25 Poll that was released on Monday. 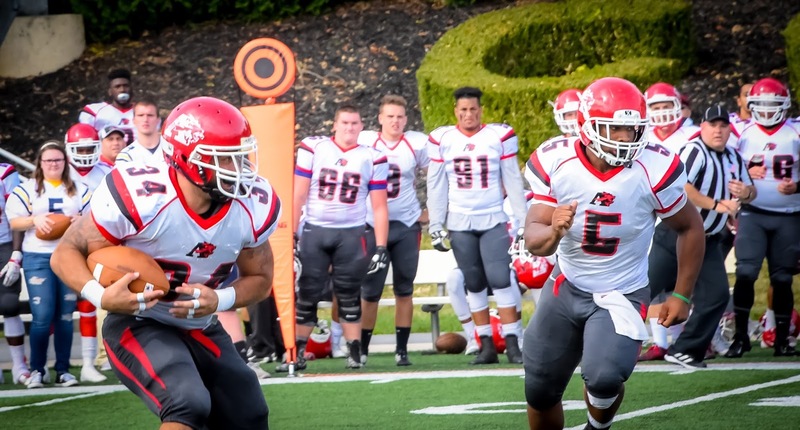 Albright moved up one spot following its 51-6 Middle Atlantic Conference victory over FDU-Florham on Saturday. The Lions improved to 6-0 on the season and 5-0 in conference play and are currently atop the league standings. The Lions received 372 points to inch up one spot from last week. Albright remains the only conference team to be ranked in the weekly poll. The top five spots in the poll remain unchanged from last week as Mount Union continues to hold down the top spot. The Purple Raiders received 37 first-place votes following their 59-17 victory over Heidelberg on Saturday. Mary Hardin-Baylor is second in the poll followed by Linfield, Wesley and Wheaton. Albright returns to Shirk Stadium for a showdown with Delaware Valley on Saturday (Oct. 24) at 1 p.m. Dropped Out: Gustavus Adolphus (Minn.) (20). Others Receiving Votes: DePauw (Ind. ), 66; Texas Lutheran, 42; Western New England (Mass. ), 40; Olivet (Mich.), 27; Bethel (Minn.), 26; St. Norbert (Wis.), 26; Salisbury (Md. ), 21; Gustavus Adolphus (Minn.), 17; Guilford (N.C.), 10; Rose-Hulman (Ind. ), 10; Cortland St. (N.Y.), 6; Berry (Ga.), 4; Framingham St. (Mass. ), 4; Cal Lutheran, 3; Dubuque (Iowa), 3; Ohio Northern, 3; Amherst (Mass. ), 2; Franklin (Ind. ), 2; Hobart (N.Y.), 2; Huntingdon (Ala.), 2; Chicago (Ill.), 1; Delaware Valley (Pa.), 1; Trinity (Conn.), 1.